Mountainous won for us at 20/1 which for a £10 eachway bet returned £270, happy days for me and hopefully you were on as well. 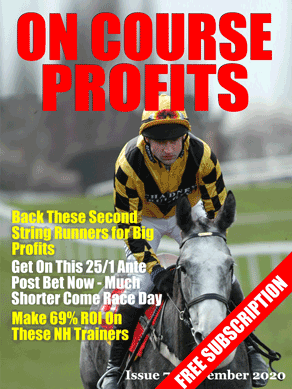 A few places gave Mountainous, including the free ante post service we made available to you earlier this month and Mark Foley's Trainer Trends service. The football bet that came from TAPS hit four out of the five selections and returned just over double the total stake. Finally for today news of a special sale, I've just heard that the Betting School Insiders Club still has a handful of places available on their Xmas discount offer. – All the usual bonus items, the systems archive, the videos and software etc. So that’s 24 back issues to get you up to speed quickly. The price is £143.93, that works out at just £11.99 per month, just our daily tips are worth 3 times that, in fact there are people charging 9 or 10 times that for inferior tips. But you don’t just get tips you will have 24 back issues, you will have access to our expert authors and their research which is what keeps us ahead of the competition. There are 10 places and once they are gone they are gone until next December. When you complete the registration form make sure you have a coupon code of 2C5736D4 in the box, it should be automatically entered.